US first editions have blue 'Bogart' labels. 1st pressings have “Manufactured and distributed by Casablanca Records, Inc." in rimtext on blue labels. Reprint blue labels include an address to in the rimtext. Covers do not state '2 Record Set' under the title. Back cover shows the older Casablanca logo without 'Records and Filmworks' printed beneath it located in the lower right corner. These covers were also used for the 1976 2nd editions which used tan 'Desert' labels, also with the older no filmworks logo. Later reissues (and they were numerous) show the '2 Records Set' text and the newer filmwork logo before returning back to the original artwork for the 1980's PolyGram reissues, the latest of which also feature barcodes. 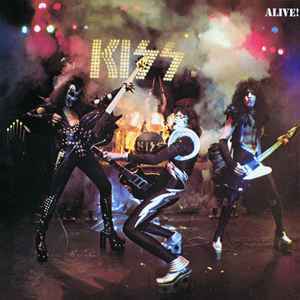 What is the best quality LP release to try and find Kiss alive? My side two has etched: T1 NBLP-7020-B-1-CTH-4 AZ. Is that a variant? Mine has the same serial number but I don’t have the “501” on the back and it doesn’t say “2 record set” under Alive. Everything else is the same. What up with that? I got a Version, there is only on side two the Kasbah/Camel label design. Side 1, 3, and 4 is the same like here. Clearly a FAKE. Please keep away. How can we remove this bogus listing from Discogs? This version was issued with an error: Rock And Roll All Nite and Let Me Go Rock and Roll are inverted in the vinil. The last song is RnR All Nite, and not Let Me Go RnR. The original version ends with Let Me Go RnR. Hi collectors! Which pressing has the best sound? 1:st Japanese or? On both of my alive albums the runoff numbers are different only with 1 number, otherwise all the same. This is 7020998. Mine are 7020798. Please let me know what's up?? ?